Jörg Schmeisser was born in Stolp, Pomerania and studied at the Hamburg Fine Art Academy, Germany 1962-67, majoring in printmaking under Paul Wunderlich. In 1967 he received a scholarship that enabled him to continue studies at the Kyoto Fine Art Academy, Japan and taught there 1969-72 and again in 1989. From 1965-73 was a regular participant as draughtsman/artist in archaeological expeditions in Greece and Israel, run by the Columbia University of Missouri. He first visited Australia in 1976; in 1978 he was appointed to the Canberra School of Art to establish the printmaking workshop and was its Head until 1997. He has travelled extensively in Europe, Asia and Australia and has held solo exhibitions since 1969. 'Rosedale crab' was printed by the artist at the Canberra School of Art from two zinc plates using pink and blue-black inks. 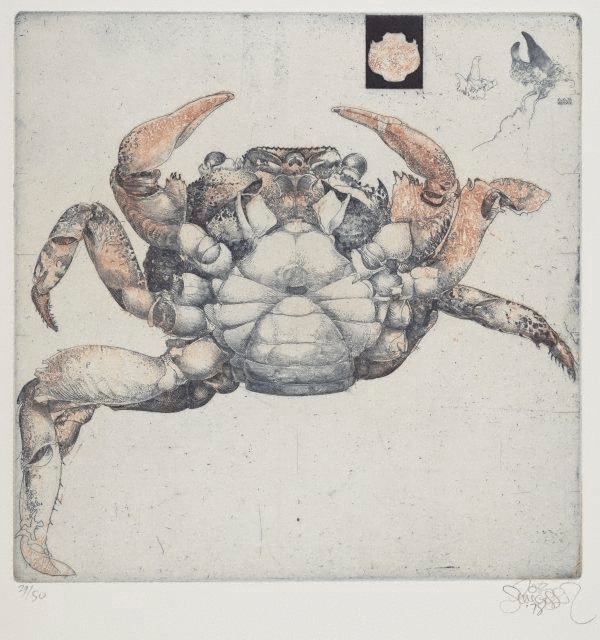 The crab was washed up from the sea; such subjects are a continuing feature in Schmeisser's prints. Rosedale is a place on the South Coast of NSW where Schmeisser and his family have visited over the years and where he is currently building a studio. Signed and dated l.r., pencil "Jorg/ Schmeisser/ '78".